A Twist on the Butchers Block End Grain Cart. I used Sapelly for Frame , shelves and Top perimeter with end grain walnut in the centre , sapelli end grain left and right of centre and oak to border the end grain section. I had hoped not to use any nails or screws however, its very heavy and it needed 8 coach bolts to make it rigid once they were in place it was rock solid. all jointed and shelves done with dominos however , I plan to use these new festool mechanical connectors next time as during glue up I noticed an error that forced me to pull it apart and was a whole day on recover. 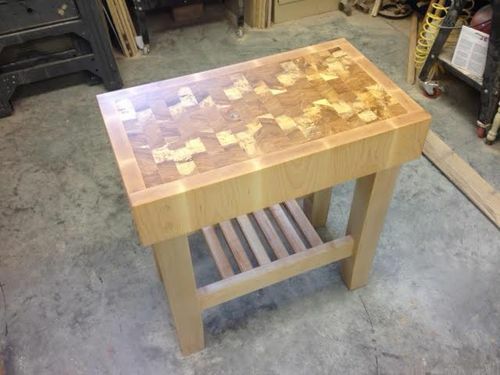 this was a progressive design and build and the toughest part was the finish of tung oil and water based poly. I gave it a slight art deco edge in the design and I’m very happy with this one. wow, this came out awesome! This is a beautiful kitchen cart. It’s a wonderful piece and so nicely done. George that’s a really beautiful piece. I would actually hate to see a knife do cutting on the “butcher’s block” lol I’d say it’s more of a serving cart ;) Nice work all the way around! Bravo,,, this is gorgeous, very nicely done. Beautiful design. Those metal parts match very well. Great job. Can you post a photo of the top’s grain pattern? Beautiful cart. Very nice. Great job on this. What do you mean by “shelves done by dominoes”? Super nice proportions and execution. Love some closeups of the top. Very pretty. Love those handles. What is the height?